Raquel and Marco is a subwoofer satellite system, that looks like a floorstanding system. It is available as floorstanding loudspeaker, as satellit or as active subwoofer (with integrated amplifier). Raquel and Marco are designed by Daniel Gattig. Raquel is the top part (compact loudspeaker) and Marco is the subwoofer, that can be positioned below (optional). 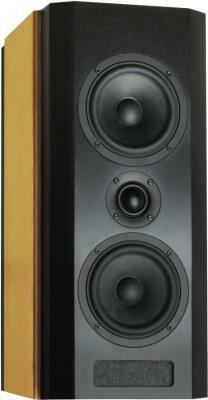 The crossover consists of a second-order filter for the two bass loudspeakers. For the tweeter a third order high pass is used. In addition two notch filters smoothen the frequency response. The frequency response of the speaker-system is flat till 20 000 Hz; the decay spectrum is excellent. The non-linear distortions remain almost consistently below 0.4% at 90 dB SPL (above 120 Hz). These are excellent characteristics. "Thanks to the excellent radiation pattern and their optimal linear on-axis frequency response, the loudspeakers could be angled pointing towards the listening position. The listening distance was 2,5 metres. One should not go for a distance of less than two metres otherwise there will not be optimum blending of the individual sound sources. What you notice first is the convincing amount of width and depth, things that are not always as clear and obvious as with these speakers, even with symmetrically aligned drivers as in a D 'Appolito arrangment. Voices and instruments take up almost palpable positions. The image expands from well in front of the speakers to way behind them and also to both sides, far further than the physical position of the loudspeakers. Just how we wish spatial imaging should be. The Wavecor trio modeled an impressively realistic stage on which you could nearly reach out and grab the musicians. The image has width and depth in which the actors are precisely positioned. "We Get Requests" by the Oscar Peterson Trio, a legendary recording from 1964, show-cases Ray Brown with crazy solos on his double bass. His voluminous instrument is placed quite far to the right, a bit behind the baseline. The brilliant, almost depthless and always clearly structured bass triggers us with enthusiasm. Sensitive souls here could even speak of "overkill", but we like this offensive deep bass character. The clear, deep bass is even present at low listening levels and comes with great ease. But these speakers can also go all out. With almost every type of music, original sound levels are in the scope of possibilities. You can start to get an idea of the dynamic limits of Raquel and Marco in extreme situations such as when the giant Kodo drums are played at proposterously loud levels. Only a tiny bit of caution with the volume control is enough to get back into the green zone. Then these giant Japanese drums, with their magnificent outbursts of bass, can differentiate from pianissimo to fortissimo. Totally obvious: one does not need greater sound levels." "Raquel and Marco offer music playback the way one wishes it: clear, finely depicted and on demand also powerful. Especially with it's almost ludicrous bass. The particularly slender shape of these loudspeakers also speaks for them, thanks to which even in smaller rooms under 20 square metres, but of course in more generous environments of 50 square meters, they rise to their best. They offer tone, dynamics and spaciousness at the highest level." The kit with high-end crossover contains ClarityCap capacitors. In series to the tweeter capacitors of type ESA are used. Baked varnish core coils and one copper foil coil replace the standard air core coil.